Model JBZ-F-60 Tumbler Paper Cup Forming Machine(Disposable Tumbler Cup Making machine) is an automatic machine with multi-working station, which has the function of photocell detection, failure alarm, counter and the advantages of humanism design, safer operation and easier maintenance. 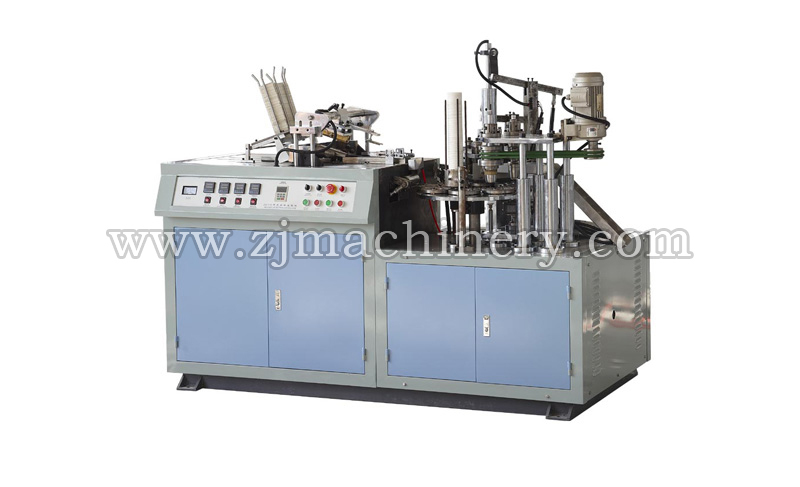 It makes one-side-PE-film-coated paper cups after running a whole procedure of automatic pre-printed fan-shape-paper feeding, cup-side-body sealing(heater), silicone-oil lubricating(for top curling, Dimethyl silicone oil 201,Food Grade), roll bottom auto punching, bottom pre-heating and pre-folding, main heating, NO bottom knurling, top curling and cup discharging. It is an ideal equipment of making hot drinks(tea, coffee, milk)disposable paper cups and ice-cream paper cups ,cake cups,one time testing cups etc.